A previous article discussed Arafat Jaradat. Shin Bet interrogators killed him. They tortured him to death. Independent autopsy results proved it. Israeli doctors were complicit. They collude in prison torture. They violate medical ethics doing so. It requires relieving pain and suffering. It's not about inflicting it. The Lancet explained. It's a leading peer-reviewed medical journal. It's one of the world's best known. It dates from 1823. It publishes original research. On March 9, it headlined "Israeli doctors accused of collusion in torture." The Israeli Medical Association (IMA) denied involvement. It lied saying so. Human rights advocates "say Palestinian prisoners have long suffered from beatings, sleep deprivation, prolonged and painful handcuffing, humiliation, and medical neglect - considered torture under international standards." On February 18, Jaradat was arrested on suspicion of stone-throwing. It occurred last November. It related to Israel's eight-day Operation Pillar of Cloud aggression. Gazans were mercilessly attacked. Palestinians say his belated arrest and interrogation reflect longstanding Israeli policy. It's "to coerce prisoners to become informants after their release." Jaradat died days after his arrest. PA chief pathologist, Saber Aloul "said bruising on his body was evidence of torture." It was too obvious to miss. Israel's health ministry disputed the findings. It said "no evidence" showed physical abuse or poisoning, "nor was it possible to determine his cause of death." Whitewash is official Israeli policy. It happens every time. Convoluted reasons are invented. "Israeli officials had originally attributed his death to a heart attack." They claimed "bruising and broken ribs were 'characteristic findings of a resuscitation, which the medical crew from the Israel Prison Service and Magen David Adom engaged in for 50 minutes in an effort to save his life.' "
Saying so was patently false. Palestinian Minister of Prisoner Affairs, Issa Qaraka, said autopsy signs "show clearly that (Jaradat) was subjected to severe torture that led immediately to his death." Jaradat's lawyer, Kamil Sabbagh, said "he was forced to sit for long periods during interrogation, complained of back pain, and seemed terrified of returning to the Shin Bet detention centre where he was being held." "By Israel's own admission, Jaradat was seen by Israeli doctors 2 days earlier, and they found him in good health. The key medical ethical question is what were these doctors examining him for, if not to assess whether he could withstand torture." 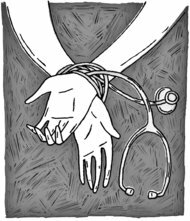 "This is precisely what the campaign regarding medical collusion with torture in Israel was launched for in 2009, and it continues to run." IMA and human rights groups want prisoner health responsibility removed from Israel's Prison Service. They want an independent authority in charge. They want suspicions and clear evidence of torture reported. IMA Ethics Board head, Avinoam Reches, said "(it's) true that every doctor has a conflict of interest between the patient and the system in the HMOs and also in the army." "But in the case of the IPS, the problem is severe because the treatment is given to people who have no freedom of choice whatsoever." The Palestinian Human Rights Organizations Council (PHROC), Adalah, Public Committee Against Torture in Israel (PACTI), and Physicians for Human Rights-Israel, express outrage over Jaradat's death. Postmortem evidence showed severe upper back bruising, deep spine bruising, and similar abuse on both sides of his chest, arms and mouth. He was brutally beaten to death. Blood around his nose was visible. He had three fractured ribs. He was in good health when abducted. His history reflected no heart trouble. Since 2001, over 750 torture and abuse complaints were filed. No criminal investigations followed. Whitewash happened every time. It's standard Israeli practice. Torturers remain unaccountable. Israel's judicial system doesn't act. Palestinian prisoners suffer. They're lawlessly held in the first place. They're incarcerated for political reasons. Their crime is praying to the wrong God. It's wanting to live free on their own land in their own country. They're systematically tortured and abused. Jaradat's death reflects others. It shows contempt for Palestinian rights. Since June 1967, 203 Palestinians died in detention. Dozens were confirmed killed by torture. An independent investigation is essential. Accountability is long overdue. Palestinian suffering continues. What's unconscionable must stop. It shows no signs of doing so. Israeli medical neglect killed Maisara Abu Hamdiyya. A previous article discussed it. He suffered from advanced throat cancer. It spread to his spine. Israel bears full responsibility. Essential treatment was denied. On April 3, the Palestine News Network headlined "Israel Continues to Assassinate Palestinian Prisoners inside Jails." "More silence means more Palestinian prisoners will be killed by Israel. Many Palestinian prisoners are suffering serious health complications." "Israel is not providing them any medical treatment. Instead it practices physical and psychological torture against them." "Actions to end this mayhem are the only way out now. International law is being ignored by Israel and the world is taking part in this crime through its silence." · A popular non-violent action by the Palestinian masses. · A political move is required from Palestinian leadership who signed Oslo accord which resulted in the current de facto. The leadership must seek a resolution from the United Nations which practically protect prisoners. It's also demanded to get membership (in) the International Criminal Court (ICC); Israeli leadership can be held accountable for its crimes against the Palestinian people and prisoners. · Palestinian factions and parties should unite and take the necessary measures to face such crisis. · Arab/Muslim masses are required to act and protest in front of the UN premises in their countries. Such pressure will contribute to create a mainstream on the agency (so) it can't remain silent. · Arab/Muslim communities in Europe are invited to carry out actions in front of Israeli embassies as well as the UN to draw an attention to what's going on. The European Union must be also pressured (to) freeze its relations with Israel due to its constant human rights violations." On April 4, the Palestinian Center for Human Rights (PCHR) urged challenging Israel in the International Criminal Court (ICC). It called on PA leaders to "fulfill their responsibilities in ensuring justice and redress for Palestinian victims of violations of international humanitarian and human rights law." Israel's legal system spurns justice. Palestinians get no redress. International help is their only option. Justice is long denied. Ratifying the Rome Statute is essential. Doing so permits holding Israeli officials accountable. Occupation harshness terrorizes Palestinians. Conditions get worse, not better. Their fundamental rights are denied. "PCHR recognises that the ICC is the principle independent body" able to act on their behalf. Step one is signing and ratifying the Rome Statute. Next comes lodging a declaration with the Court's Registrar. It's done under Article 11(2) and 12(3). It accepts the Court's jurisdiction. PCHR also urges other nations to support Palestinian rights. They're able to through the well-established universal jurisdiction principle (UJ). It holds that certain crimes are too grave to ignore. They include crimes of war, against humanity and genocide. Nations may use UJ to investigate and prosecute foreign nationals. They may do so when countries of residence or origin won't, can't, or haven't for any reason. Israel used it to convict and execute Adolph Eichmann. A US court sentenced Chuckie Taylor to 97 years in prison. It did so for committing torture. Britain used a Spanish court provisional warrant to apprehend and detain Augusto Pinochet. Holding him under house arrest for 18 months set a precedent. Bogus ill health claims freed him. Back home he was irreparably damaged and disgraced. "The official position of defendants, whether as Head of State or responsible officials in Government departments, shall not be considered as freeing them from responsibility or mitigating punishment." Israeli criminals avoided accountability long enough. Ignoring them longer is intolerable. On April 4, West Bank cities shut down. Shops, schools, universities, and businesses closed. Thousands turned out to mourn. Hamdiyeh was laid to rest. He's buried in southern Hebron's al-Shudada cemetery. Palestinian anger is palpable. It's justifiable. Israel killed him by neglect. Proper treatment would have saved him. Israel wanted him dead. He's gone but not forgotten. Clashes erupted in Hebron, Bethlehem, Tulkarem, and other West Bank locations. Israel challenges public outrage violently. It abhors stability and calm. It provokes confrontations preemptively. On April 3, it bombed Gaza. Doing so broke November ceasefire terms. They're not worth the paper they're written on. Israel does what it wants with impunity. The same day, Israeli soldiers killed two West Bank youths. Amer Nasser was shot to death in cold blood. Three boys tried to reach him. Soldiers blocked them. An ambulance was delayed 30 minutes. Anyone trying to help was threatened. Deiyaa' Nasser tried and was arrested. His whereabouts are unknown. Amer's cousin was killed. Naji Abdul-Karim Balbisi's body was found at dawn. It was near an Israeli checkpoint. He was shot from behind in the back. Doing so was cold blooded murder. Israel often fires live ammunition against nonviolent protesters. Accountability never follows. Since Pillar of Cloud ended last November, its forces killed 63 Palestinians. Thirteen Gaza incursions occurred. Thirty attacks targeted Gaza fishermen. Multiple daily incursions terrorize West Bank communities. Beatings and arrests follow. Children are treated like adults. Apologies aren't forthcoming. Israel never says it's sorry. Life in Occupied Palestine reflects cruel and unusual punishment. For many it's much too short. His new book is titled "Banker Occupation: Waging Financial War on Humanity." Oh yes, Hamdiyya. Guess, what, it's Pallywood time again with the ever-hating Palestinian prop machine that churns out lying agitprop, all of which Lendman gobbles up without questioning. What a scandalmonger that Lendman is. Here's what real barbarism is like. It was done to the Jews, not by them. It's obvious to me that Muslim Arabs, who hate Jews as much as the Nazis did would do the same thing to them if they could. Meanwhile they're the only group of losers who actually want to martyr themselves for their false god Allah, therefore it's kind of hard to feel sorry for them when they get what they want. They never wanted any solution other than EXTERMINATION OF ISRAEL, so fork Lendman, I'm for Israel and he can take his precious Palestinians and stick them somewhere.